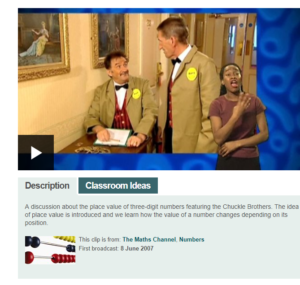 Welcome to Tutor Doctor Buckinghamshire's Free Interactive 11+ Bucks Course! If you are a child reading this on your own, or with a parent, a nanny, or a granddad, whoever – this is for you. This blog will look better if you open it in Chrome. What comes after the Thousands? If you answered ‘millions,’ take a look at the chart below. There are two extra columns in-between the thousands and the millions. 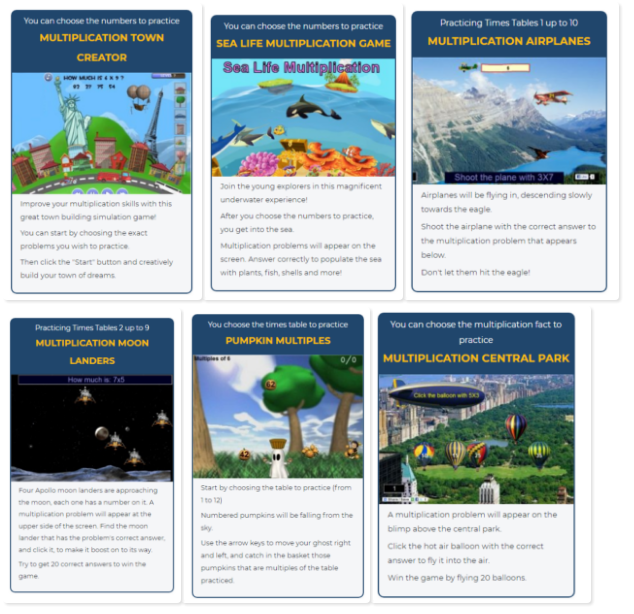 If you click on the image, it will link you to teaching videos, and interactive practice questions. Resist any urges to randomly click around the sites I have linked you to; stick the sections that are relevant to the Bucks 11+. 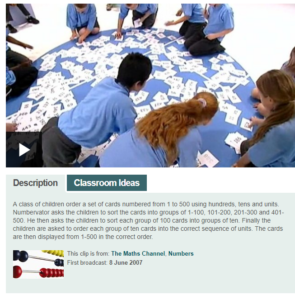 The Khan Academy clips and the BBC clips are wonderful, but they are not targeted at the 11+ in Bucks the way this blog is. The whole point of this blog, is to focus on the questions that will be on the Bucks 11+ papers. Complete all pages numbered 1 -5, Activity, Video, and Test. 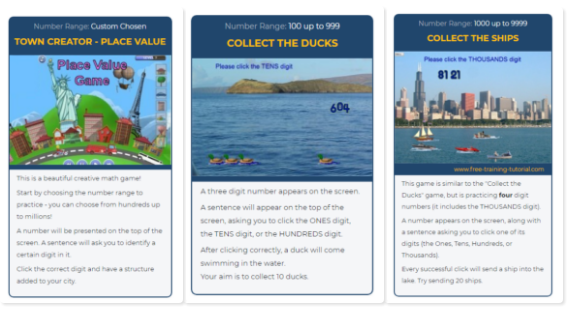 Have you completed all the pages numbered 1-5, Activity, Video and Test? If so, read on. TIP: You can draw out the columns pictured above, (in pen,) then when it comes to doing the sums, you can write your sums in – in pencil – rub out and re-use. If you don’t completely get it, here is another clip about ordering numbers in the H, T and U. This next section is for all students. 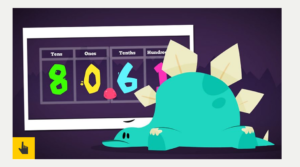 The screen shot below is from the Khan academy website. Watch all vidoes marked in the left hand column of the site, (in blue writing). 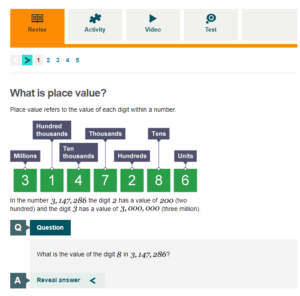 You do not need to do all of the sections, only the first seven: ‘finding place value’ to ‘place value when mulitiplying and dividing by 10’. Then stop. Going from the millions column (Mill) to the Millionths (Millths) column will be new to some of you in year 5, but that is for your interest only. The 11+ is focused on the tens of thousands to the thousandths – the section highlighted in bold. Let’s start off with the fairly easy clips. Write out the column names (in pen,) write the numbers below in the columns (in pencil,) to help you at first. If the above hyperlink doesn’t work, copy and paste the link below. FAQ: How long will each lesson take? About two hours, but there are a lot of practice materials and so some might need to be done over several days. 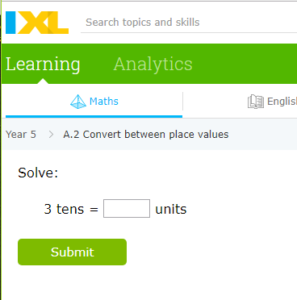 You can only practice ten IXL questions per day, so I definitely recommend using that daily. 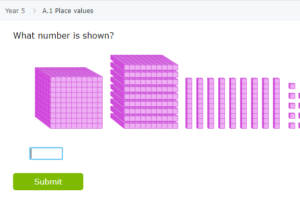 If you don’t know your times tables up to 10 x 10, I suggest you start now. In what position are the letters E, J, O, T and Y? There is a question aimed at the position of the letters in the alphabet, so you should learn these positions beforehand to save precious time in the exam. You don’t have learn each one individually, though you can eventually, but to start off with it’s important that you know which letter comes 5th,(look at the line above) 10th, (look at the line above) 15th, (look) 20th (look) and 25th (you can probably guess that one). That way, to find the letter at position 21, you don’t always have to start at A is 1 and waste time. For example, to find the 21st letter, you can say the 20th letter is T (as in T for twenty) and then you only have to count on one number – much quicker. What letter is in position 5? What letter is in position 10? Whate letter is in position 15? What letter is in position 20? What letter is in position 25? What letter is in position 6? Find the letter in position 5 and count on one letter. What letter is in postition 11? Find the letter in postion 10 and count on. What letter is in position 21? Learn them, then test yourself. What is the middle letter of the alphabet? It is helpful to remember that there are two in the middle of the alphabet, numbers 13 and 14. Those letters are 13=M, 14=N. What letter is in position number 15? You no longer HAVE to start at the beginning of the alphabet and count all the way on. What position is the letter W in? What position is the letter J in? What position is the letter P in? What position is the letter U in? You may be able to see clearly which letter is in the middle when you have only 3 letters left. If so, there is no need to waste time crossing them off. However, do use the crossing off method the rest of the time. Not only is it quicker, it is more accurate. If all the consonants were taken out of the alphabet, what position would the letter I hold in the word ACCOMPLISHMENT? TIP: the quickest method for doing this is to use the alphabet line above and lightly cross off the consonants, and count. If all the vowels were taken out of the alphabet, what position would the letter H hold in the word HOTEL? If all the letters in the word LIGHT were removed from the alphabet, what would be in the new position 14 of the alphabet? If all the letters in the word BOOK were removed from the alphabet, what would be in the new position 19 of the alphabet? If all the vowels in the word MISSISSIPPI were taken out of the alphabet, what position would the letter P be in? If all the consonants in the word TERANODON were removed from the alphabet, what position would the letter N be in? When you have learnt the alphabet and the positions of the letters frontwards, it is time to learn them backwards! If you have any dyslexic tendencies, it is best to leave this for another time in the future. The alphabet is confusing enough for you as it is! If the word ALPHABET was written backwards, what position would the letter H be in? Learn your alphabet numbers backwards, and it will save you lots of time in the exam! Improving your vocabulary is just a part of growing up, but it is especially important when you have the 11+ soon. 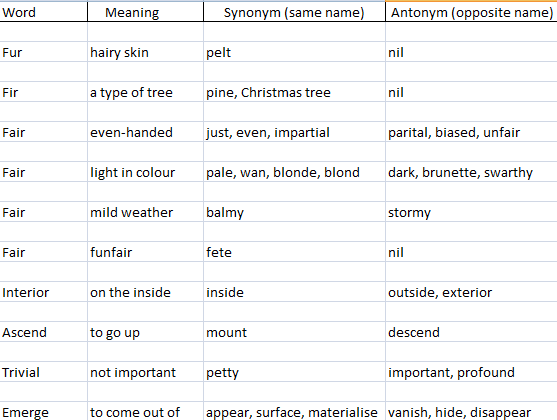 Put the word and the antonym into sentences. Try to use the words this week. Play a game with your family – cheer if someone uses one of the week’s words. Get a small mirror and look at the way things reflect in it. If there is a gap in-between the object and the mirror, the gap will be reflected. What is closest to the mirror will remain closest in the reflection, and what is furthest away will remain furthest away. It won’t change shape, size, shading, number. 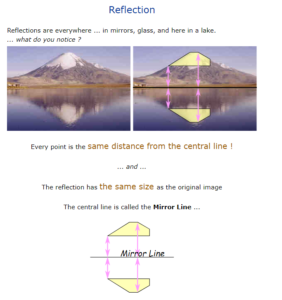 Where is the mirror line? Click on the link below, read the entire page, do the exercises and the questions at the foot of the page. Look at letters and a variety of shapes (triangle, square, rhombus) in the mirror. Use a vertical mirror line, a horizontal one, and at an angle. Don’t just look at what happens, think about what happens. Welcome to week 18! 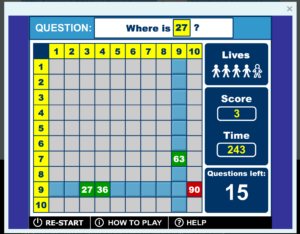 This week we have Verbal Reasoning, comma use in English; a free non-Verbal Reasoning test with computerised answer sheets; and in Maths we look at finding area of an irregular shape using isometric paper. Welcome Back! This week we are looking at verbal reasoning techniques, analogies, and comprehension of a text. Plus reflection and rotation for maths. All necessary tools for 11+ students. This week there is a main focus on area and perimeters as those are almost guaranteed to come up on the Bucks 11+ exam paper. We also continue practicing non-Verbal reasoning and abbreviations.